NTTC was established on 1 July 1994 under the Northern Territory Treasury Corporation Act to undertake the financial management of the Territory's public finances. NTTC's mission and objectives are designed to advance the financial interests and development of the Territory and improve its market identification in both domestic and international capital markets. NTTC's objective is to provide the Territory Government with cost-effective funding, efficient financial management and reliable service and advice. NTTC's board and management are committed to achieving this objective while upholding high standards of corporate governance, transparency and accountability through controls, policies and frameworks. 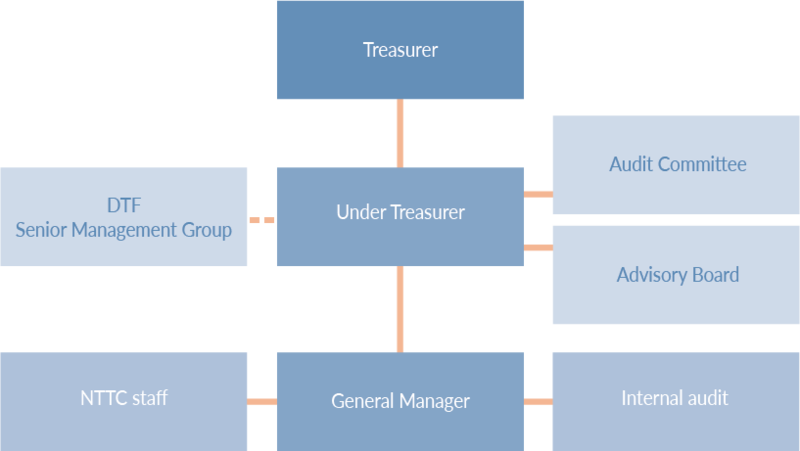 Under section 5 of the Northern Territory Treasury Corporation Act, the Under Treasurer of the Department of Treasury and Finance (DTF) is designated as the Corporation sole and is subject to the direction of the Treasurer of the Northern Territory. An Advisory Board and an Audit Committee have been established to assist the Under Treasurer with issues relating to NTTC's operations. Under section 8 of the Northern Territory Treasury Corporation Act, NTTC has established an Advisory Board to assist the Under Treasurer with issues relating to the NTTC's operations. The Advisory Board is constituted to be the Under Treasurer and no more than five other persons appointed by the Treasurer of the Northern Territory. The Board meets quarterly to review and monitor the performance of NTTC, its business risks and its performance in relation to its objectives. The Board also provides guidance on policy, analysis of economic conditions and advice on aligning borrowing and investing intentions with interest rate expectations. NTTC's Audit Committee comprises the two external board members, Mr Richard Ryan and Mr John Montague, and is chaired by Mr Ryan. The Committee provides advice to the Under Treasurer on operational issues and in relation to internal and external audits. The Audit Committee meets prior to all Advisory Board meetings, or as necessary. KPMG Darwin undertakes the internal audit review of the NTTC's business while the Auditor-General of the Northern Territory performs the external audit of the NTTC's activities. NTTC reports to the DTF's Senior Management Group (SMG), which is responsible for strategic decision making and policy setting in relation to DTF’s operations and internal processes. SMG also provides leadership and strategic direction to the agency. The main role of SMG is corporate governance and developing corporate capabilities, such as people, systems and environment.